One of the more amusing aspects of writing a blog and commenting on other blogs is the almost unending stream of false information and wrong beliefs one encounters. As former President Reagan said, "It's not that our . . . friends don't know anything, it's that so much of what they know just isn't so." In this case, these people get to vote, and make their opinions known to elected officials, so it is somewhat important that what "just isn't so" gets pointed out. 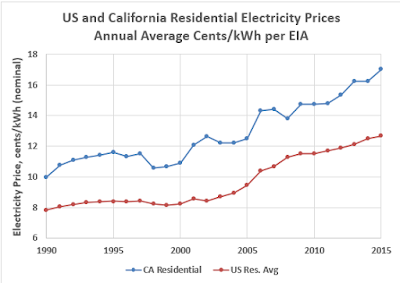 Hence, this post on the disparity between US average electricity prices and the higher prices in California. The facts show that California residential electricity use is below the national average, and the price per kWh consumed is slightly above average. The reason for the higher price is low electricity consumption in a mild climate, by a very large number of customers, approximately 15 million customers. The common wisdom (that "just isn't so") is that California electricity prices are 1) higher than the rest of the country, 2) higher than they should be, and 3) higher because of stupid California policies to build renewable energy plants such as solar and wind. Each of those three things are addressed in turn below. California residential electricity is approximately 25 percent higher than average, but not the highest in the country. 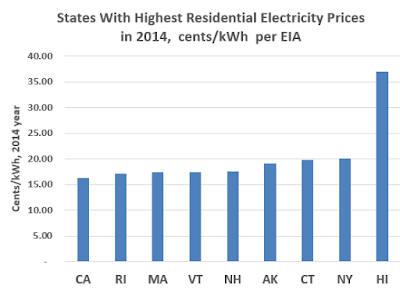 Data from EIA for 2014 shows that California is 9th highest, that is, 8 states have higher residential electricity prices. Those are Rhode Island, Massachusetts, Vermont, New Hampshire, Alaska, Connecticut, New York, and Hawaii. The same data is shown in Figure 2, below, as a bar chart. What is also true of California electricity prices is that they have been a bit higher than the US average for many years. Even in the late 1970s and early 1980s, it was common knowledge in the chemicals and petroleum industries that electricity prices in California were higher than in most other states. Therefore, it can be seen from the above that California residential electricity prices are a bit higher than the US average, but by no means are the highest in the US 50 states. California residential electricity prices are where they are, and where they should be, due to a number of factors. The most important factor is the state has a large population, 38 million people with 15 million residential customers as of 2014, but has very low electricity consumption per customer. The low consumption per customer is due to the mild climate with low humidity. Or, as the EIA states, "In most of the more densely populated areas of the state, the climate is dry and relatively mild. More than two-fifths of state households report that they do not have or do not use air conditioning, and almost one-seventh do not have or do not use space heating. Residential energy use per person in California is lower than in every other state except Hawaii." 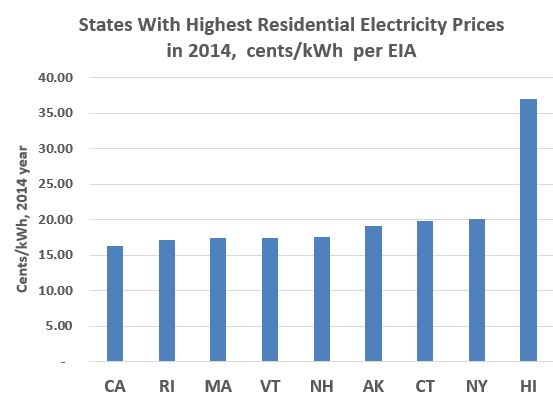 Things have changed, but only slightly, since EIA wrote that, as Maine has barely edged out California for second place in residential electricity use per customer. The second important factor, after the mild, dry climate, is the large infrastructure for transmission and distribution that must be built over mountainous areas within the state. In contrast to the nearest state in size and population, Texas, California has many more mountainous areas where transmission and distribution costs are much greater. Combined, a low per-customer electricity use and large, costly network or grid requires that each kWh sold command a higher price to pay for the grid's assets. The utilities are allowed a 10 percent return on capital employed, so smaller volume of electricity sold must command a higher price. Finally, the 16 cents/kWh and 562 kWh/month, on average, yields a lower electric bill for the average customer compared to the US average. The average bill for a California customer is only $91 per month, compared to the average for the US at $114 per month. This third "just isn't so" reason is easy to debunk after showing in point 2, above, that California residential electricity prices are not higher than they should be, nor higher than the US average. As shown above, both the average monthly bill, and the consumption in kWh/month are less than the US average. In fact, the average consumption per customer is third lowest out of 50 states plus the District of Columbia, DC. Yet, the impact of renewable energy policies in California may have some small impact on electricity prices. Solar power, and wind power are addressed separately. Solar power, as shown earlier on SLB, had almost zero impact in California as little as 5 years ago. Only in the past 5 years, since 2011, has solar power been added at the grid scale. At present, there is almost 8,000 MW of solar power installed, almost all of which is PV. The remainder is solar thermal. The contribution of solar power is small, at approximately 6 to 7 percent of annual power sales. It is clear, therefore, that the impact of solar power could not be a factor before 2011, yet California prices (see Figure 1) were 25 to 30 percent higher than the national average since 1990. The contribution of wind power in California has increased from 1.5 percent in 2001 to approximately 6 percent in 2014 of all electricity generated in-state, per the California Energy Commission data. The fact is that wind resources in the state are few in number and below average in output, as measured by percent of installed capacity. California wind turbines produce approximately 22 to 26 percent of installed capacity, compared to the Great Plains states of 45 to 42 percent of installed capacity. Essentially, the wind blows stronger and more steady in the Great Plains states. It can be seen, then, that wind power contributes only a small fraction of total electricity in the state, and the electricity prices are higher due to low average consumption and a large asset base. There can be no validity to the argument that policies on wind energy cause California electricity prices to be higher than the US average. just bought a 12 month energy supplier contract for my TX home at 4.59 cents/KwHr, down from the expiring contract's 10.4 cents per KwHr. Don't know why powerto choose doesn't exist nationwide. Far too many locales stupidly signed utility monopolies. CA's 16 cents per kilowatt hour isn't 25% high. It's 320% of the 5 cents I pay here, in Houston, TX. To SuperDad and Anonymous, thank you for proving my point. Texas has both hot and humid climate, especially in the Houston area. The kWh per month required to keep a residence comfortable is about triple the average in California. For coastal areas, such as where I live in California, we don't even have air conditioners because we don't need one. The monthly bill for electricity is about the same, Houston compared to California average. When considered as a fraction of one's monthly pay, Californians pay far less for electricity than Texans because average salary is higher in California. And as the article states, renewable forms such as wind and solar have nothing to do with it.